AMESBURY • Britain has called on Russia to provide details about the Novichok nerve agent attack on a former double agent and his daughter after two British citizens were struck down with the same poison. The two Britons, a 44-year-old woman and a 45-year-old man, were critically ill after an apparently chance encounter with the poison near the site of the March attack on former double agent Sergei Skripal and his daughter Yulia. 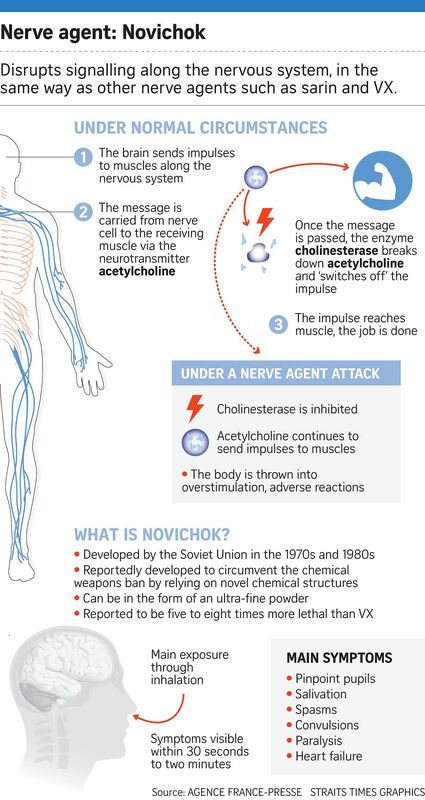 Britain has accused Russia of poisoning the Skripals with Novichok - a nerve agent developed by the Soviet military during the Cold War - in what is the first known offensive use of such a chemical weapon on European soil since World War II. Russia, which is currently hosting the World Cup, has denied any involvement in the March incident and suggested the British security services carried out the attack to stoke anti-Moscow hysteria. "The Russian state could put this 'wrong' right. They could tell us what happened, what they did and fill in some of the significant gaps that we are trying to pursue," British Security Minister Ben Wallace said yesterday. "I'm waiting for the phone call from the Russian state." Kremlin spokesman Dmitry Peskov said he did not know who Mr Wallace was but that Russia had offered Britain its assistance in investigating the nerve agent attack and had been rebuffed. British Prime Minister Theresa May, speaking alongside Chancellor Angela Merkel in Germany during a visit to Berlin, said it was "deeply disturbing" that two more people had been exposed to Novichok, adding that her thoughts were with the people of the area. In the latest twist in one of the most mysterious poisonings in recent years, the two Britons, who were taken ill last Saturday, were initially thought to have taken an overdose of heroin or crack cocaine. But tests by the Porton Down military research centre showed they had been exposed to Novichok. Britain notified the global chemical weapons watchdog, the Organisation for the Prohibition of Chemical Weapons, about the poisoning. It is unclear how the two Britons, whose background has nothing to suggest a link to espionage or the former Soviet Union, came into contact with the poison, which is slow to decompose. "The working assumption would be that these are victims of either the consequences of the previous attack or something else, but not that they were directly targeted," said Mr Wallace. Paramedics were called last Saturday morning to a house in Amesbury after the woman, named by media as Ms Dawn Sturgess, collapsed. They returned later in the day when the man, Mr Charlie Rowley, also fell ill.
Amesbury is 11km north of Salisbury, where Mr Skripal - a former colonel in Russian military intelligence who betrayed dozens of agents to Britain's MI6 foreign spy service - and his daughter were found slumped unconscious on a bench on March 4. Health chiefs said the risk to the public was low, repeating earlier advice that the public should wash their clothes and use cleansing wipes on personal items. But the exposure of the two Britons to the nerve agent will stoke fears that Novichok could be lingering at sites around the ancient English city of Salisbury.